In May 1993 and September 1995 two "similar" l-numbers were introduced. The first, L128, is an inky black fish with off-white to bluish spots and the second, L200, an olive greenish-yellow fish with off-white to yellow spots. These two fish have many features in common, but two are especially interesting. Firstly, the fish have apparently identical morphology. 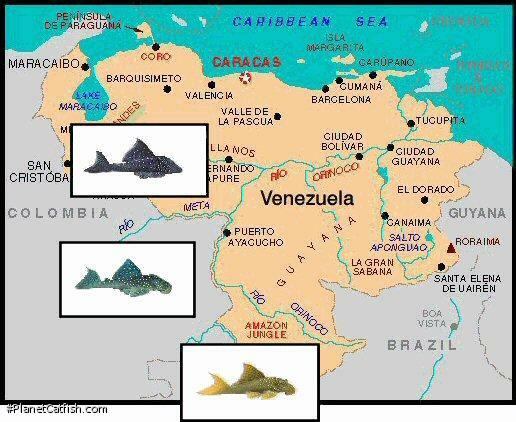 Secondly, both fish originate from - albeit different parts of - the vast reaches of South America's Rio Orinoco. Identical morphology means that the animals are the same shape and, in some cases, can be extended to include the fact that the fish show the same sexual differences with age and growth. This interesting simlarity is made more complex by variations found in these fish. Both appear to have a head spot and a body spot colour variation. Head spot species only exhibit spotted decoration forward of the dorsal fin. Body spotted forms show this same spotting but carry it right along the back of the fish, often onto the caudal fin. Additionaly, L200 appears to have both regular and shark-fin forms, but more on this later. Upon greater investigation of the distribution of these fish along the Rio Orinoco it appears that the further north you go the darker the fish gets and the further south, the lighter. Thus all hues from black, thrugh blueish green, green, olive green and ultimately mustard yellow have found their way into the hobby with variable regularity and pricing. This at least explains the occasional sighting of bluish-green fish that tend to be sold as L128. The Northern, darker fish is less commonly exported and thus commands the highest price. Anything that closely resembles the dark fish will similarly merit a greater fee. Ten years on from their arrival, positive generic placement still eludes these fish. When not placed within the sub-family Ancistrinae, they have been labelled incorrectly as Chaetostoma and Baryancistrus, it looks like they'll end up in Peckoltia. In many ways they are close to Hypostomus; certainly sharing many behavioural traits with that genus. However, to most accurately classify these fish, perhaps it is necessary to place them in a new genus. The "shark-fin" is an interesting feature worth discussion. The fish shown at the top of this page is one such individual and can be thought of as the "true" L200. It is a bright yellow fish with a high dorsal fin that appeared in the origianl DATZ L200 article. Bear in mind here what an l-number is. It is simply a label for a particular fish that is visually different from any other. As a fictional example, L123 could be a male of a particular species and L222 be a female of the same, given that the two look different. In the same way different l-numbers can be given to juvenile and adult fish. Just to confuse issues, if an l-number does appear very similar visually but is known to come from an entirely different drainage system, then it can generate an additional l-number too. L27 Vs Panaque nigrolineatus is a good example of this. Anyway, back to L200; and the "shark-fin". Maybe this is a dominant male feature? But why don't we see this in L128? Is it merely because L128 are less commonly imported? The different spot patterns may simply be population variation but might also be sexual dichromatism creeping in too, with larger, brighter spots on the males than on the females. Then again, it is possible the shark-fin and the regular fin are two different species with L128 making up the trio. On the other hand, other authors have suggested all these fish are one species. The fact of the matter is we just don't know - yet. So, why is all this pondering important? Let me tell you the tale of Sawbwa resplendens, the Asian Rummy Nose. When first introduced, this pretty fish took the hobby by storm. Breeding successes did not follow - despite various attempts by experienced breeders. It was not until this fishes "secret" came to light that captive breeding was successful. When collecting this fish, it was found with a similar fish that was dullish brown, lacking the dashing silvery flanks, attractive red face and caudal flashes of the rummy nose. The collectors discarded this fish and brought only the saleable, attractive fish to the exporters. That "secret" was the fact that the dull brown fish was the female of this species. Once all humans involved understood this, captive reproduction and indeed farming of this fish was not long off. L200 remains in the diminishing group of small to medium-sized l-numbers that has not reproduced in captivity. It is a very hardy pleco and, given its adult size, it would be safe to assume that it could reproduce at around 120-140mm. The failure here will boil down to us aquarists missing something about the fishes reproductive habits. Shark-fins and other variances are important considerations, even if simply to ensure we have boys and girls of one species." Type Locality Rìo Orinoco 117 km W of La Esmeralda, 03.28998°, -066.60004° Amazonas, Venezuela. Etymology Greek, hemi = the half. 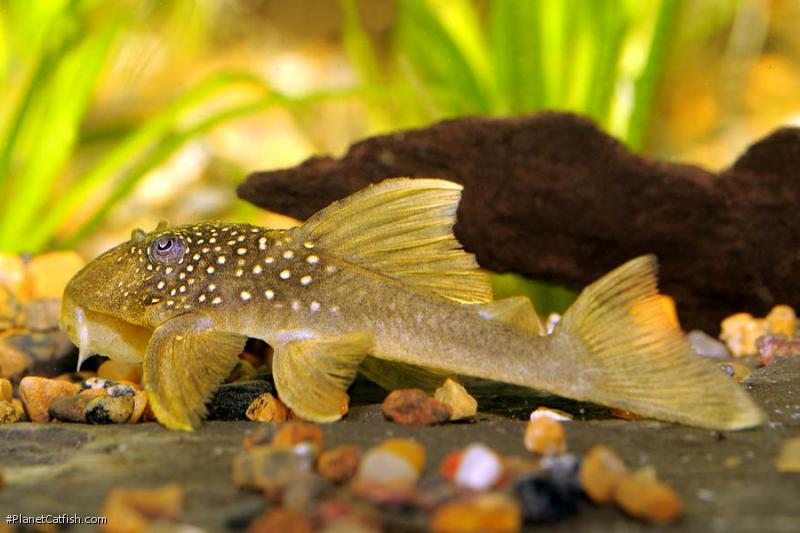 While the Greek, agkistron = hook, is thought to be the root of the term ancistrus, hemiancistrus can be taken to mean that these species have a part (not exactly HALF) of the features of the genus Ancistrus, but not ALL of the features. This specific epithet refers to its olive green colour in life. Size 190mm or 7.5" SL. Find near, nearer or same sized spp. Identification The green colour form of this fish can only really be confused with Baryancistrus demantoides. The key to tell these two apart is that the dorsal fin and the adipose fin are connected in Baryancistrus species, and separated in the this species. Furthermore, have a look at the shape of the mouth. H. subviridis has a almost perfectly round mouth, while B. demantoides shows a more rectangular mouth. Ranges in colouration from blueish green to yellowish green (which correlates to how far south on the Rio Orinoco the fish was collected). Head and body spots are variable within these colour forms. May be the same species as L128. Distribution South America: Venezuela: Upper Rio Orinoco from at least at Minicia up to Rio Ventuari and in the Rio Ventuari itself. Other Parameters This fish revels in fast flowing water. Feeding The fish is omnivorous and easy to feed. Although an effective algae eater, it should be given a varied diet of prepared foods. Compatibility The challenge with this fish is to find fish that will live in such fast water. It will live in calmer water should you wish to keep this fish in a medium sized community setup. A good "starter" l-number. Suggested Tankmates This fish is a good pleco for a community tank despite its natural habitat in rapids as it will adapt to less hectic water conditions. If you do want to try faster water, Semaprochilodus characins and silver dollars of various types are a good choice for mid-water companions. Breeding Has been bred in the aquarium. A cave spawner, the male guards a clutch of approximately 40 eggs. Eggs hatch in 3-4 days, fry absorb their yolk sac and start feeding in 10-11 days. References DATZ matches Aqualog which features this fish in supplements 1 and 2.